How much should you charge for your training sessions? I once heard that price is relative to the cost of everything else on sale in the marketplace – well with Personal Training it gets even more tricky than that. That’s because training is an intangible service that’s highly dependent on the person delivering it (the trainer, ie YOU) That’s what this blog is about by the way – if the product is YOU, then no one should be telling you how much to charge or be steeling any of your money. Dumping the gym is the first step to getting paid what you’re worth. Back on subject, your rates aren’t dependent on the number of certifications you have, the kind-of shape you’re in, or how many years you’ve been a trainer. These are all factors that influence the price, but they don’t determine it. The sole determinant is your own self-esteem – the belief you have in yourself and your training services. Yeah, you could say that about any field, but it’s the most true in this one. That’s both a scary and at the same time a liberating thought. What do you think, performing at your peak, you could get away with charing? That should be your rate. If you have no experience right now, charge 10-20% less than that until you become comfortable with closing sales and giving outstanding service. But on future training packages and all re-signs, begin to slowly raise your prices. What really determines the price you can set as a Personal Trainer is your psychic value. With pretty much everything we purchase, this is the deciding factor. That’s what makes a Maybach nearly 50 times more expensive than a Hyundai. Your ability to create that value is your primary asset. But people don’t consciously know this. The reason most clients think they need a Personal Trainer is to improve their appearance or performance in some way. And surely, I and I’m sure you too achieve amazing results with the people we work with. That’s one of our key success areas of course. But it’s not the only one, and surprisingly it’s not really the most important one. Since results are largely dependant on factors that are out of our control, results can’t be the deciding criteria. What Personal Training starts out as is a way to get in shape; what it actually turns into is a high quality, highly regimented activity to engage in on a regular basis. That’s what’s cool about it – in an otherwise boring life, it becomes something fun and challenging to do! It’s the training session and the trainer that are the products that the client is paying for, not the end result. The feelings the trainer and session can create will be what determines price. Of course, these types of sessions will also get better results, but it’s the experience that comes first. In order to create value in your training sessions that you can charge more money for, you need to start thinking differently about them. We need to view it as a product, and just like any other product, we need to start thinking about what it’s made of. How does a great training session sound? My point is that you need to consider all of the factors that could directly, indirectly, and psychically affect your session. The reason Jackie Warner can charge over $400 for her sessions and some of her trainers can charge over $200 isn’t because they’re better trainers (if you’ve watched her show, you know that’s clearly not the case). The reason is because they train out of an exquisite studio in a posh neighborhood and they’re all good looking. These are factors that have nothing to do with the training itself. You don’t need to hit the same hot buttons, but you get the idea. There are a million and one ways to increase your session’s psychic value, and we’ll get into a few of them later. Yeah, so back to price – in most major buying decisions, price isn’t the deciding factor. I’d challenge you to identify a single thing you own that you bought just because it was the cheapest. People don’t by training like that either, so just lowering your prices isn’t the winning formula. Like we just talked about, it’s all perceived value. It’s only bad trainers that cite price as the primary reason that clients don’t buy. Successful trainers doesn’t view price as the deciding factor. They pay attention to all the facets of the job, and instead spend more time and effort in justifying price, rather than arguing over it. But no matter how justified your rates are, there’ll inevitably be some people that’ll think they’re too high. Maybe they had no idea how much Personal Training cost, or they’re just used to bargaining for everything they buy. But sure enough you’ll find ’em – clients that’ll fight you on price. You never want to get involved in a price discussion over your services. It’s tempting to do it, especially if you need the work, but don’t! Consultant and sales people in every field will tell you the same thing – people that fight you on price are usually the highest problem customers around. These are exactly the people you want to avoid. Just politely let them know that your prices have been set in competitive marketplace, and with all things considered you actually turn out to be a tremendous value over other trainers. Interestingly enough, price is directly related to perceived quality – people expect to pay more for the best. For that reason, when something costs more, it’s considered better and will probably lead to even more demand – you can actually hurt yourself by charging too little! I’ve noticed this first hand. A little while into my solo career, I went through a long dry spell. Because I wasn’t selling to a particularly affluent clientèle, I incorrectly assumed price was the reason. I eventually cut my sessions to a half hour and made my rates ridiculously low. This of course didn’t help business pick up in any way and killed my self-esteem and credibility. Over the next year I got committed to fitness – I raised my prices, improved the quality of my sessions, and paid attention to my image. In about a year, in the exact same training environment, I had more than tripled my prices, and was so booked I had to hire 3 part-time assistants to help! If you’ve done your job of justifying your price through outstanding sessions, you’ll find clients won’t be looking for concessions on price, but instead on training frequency. They’ll want to cut back on the number of sessions they use per week so they can fit it into their budget. Unlike the price shoppers, these types of client are earnest in their desire to train with you, and usually turn into great clients and sources of referrals. They’d rather work out less than resort to an inferior trainer. The only drawback is that this type of client may turn out to take more time per week to service, since they may call or email you more for coaching in between sessions. They also may take away peak time slots from other clients that are training at a much higher frequency. For these reasons, it’s up to you to decide whether you’ll allow less than twice weekly training in your practice. You’re in great shape yourself. You have a sound knowledge of all the key information to handle common client questions. You’re perceived as more busy and in demand than other trainers. You’re personal appearance indicates that you’re one of the best in your field. You have a professional attitude, like what would be expected from one of the world’s top trainers. You are punctual and prepared every single time. Your sessions are always challenging and excellent in every way. You have a positive personality. You have more experience than other trainers and this is directly obvious from training with you. You are more highly qualified than other trainers and this is directly obvious from training with you. When you put all of these together you get a complete package that can easily go for more than what other trainers are charging in the marketplace – even twice as much. Through these factors and many more I haven’t listed, you can eventually grow into one of the highest earning trainers in this field. If you’re having trouble getting people into your funnel in the first place before price even comes up, you probably have an image problem. That means people don’t have an interest in you and aren’t willing to take a chance on you in the first place. You’re probably not coming across as credible to them. Do you sound confident or needy? Do you appear to be a professional or an unskilled amateur? Did you clearly demonstrate knowledge or the opposite, a lack of experience? Did you get them excited about everything they’ll accomplish with you? When you’re training others, do these sessions appear to be the absolute best on the market, or just like everyone elses? What’s funny is you might come across the opposite situation where your client’s are very wealthy and have absolutely no buyer’s resistance at all. They’re actually slightly insulted at any indication of price or any obvious sales techniques. And if you hang around this field long enough and keep racking up credibility indicators, you’ll get to a point where price is no factor – you can charge whatever you want and people will happily pay! These types of clients are usually used to the best of everything, and paying for it isn’t a problem for them. This type of wealthy client is rare however. I’ve had to sidestep price discussions with clients who were multimillionaires many times. That’s because even the wealthy in many cases are very careful and shrewd about how they spend their money; that’s how they got rich in the first place. So charging less isn’t the answer – it’s creating a climate where price is justified. There are some other minor tactics involved that can boost your prices, like having them in writing, having the price discussion in a private place that’s on your turf, and having your certifications hanging on the wall at the time when price is brought up. You need to be creative and think of ever little thing you can do that’ll add more perceived value to your sessions if you want them to be the highest priced. This ability to crawl into the mind of a customer and understand what they consider value is something that’ll pay off permanently. Awesome post kaiser. I too went through charging mediocre rates in the past. Now i charge more than anyone in my immediate area and things are picking up nicely. I have no doubt in my ability to help others and I’ve been studying and living the lifestyle of fitness for about a decade so i feel that i am worth what i charge. Others reading this blog should realize that charging high rates separates you from the rest of the trainers, even big chains like Gold’s and Planet Fitness (I agree with your blog on the freaking lunk alarm). Establish yourself as the professional and walk in there like you are the man(or woman) and tell them what you can do for them and why you are qualified. Then stand your ground and see what happens. When you get a few of these clients things will be rolling nicely. Im just starting out on my second journey into training, and I’m in a new location, but these things are tried and true. This blog is great and keep up the good work Kaiser, you arent helping everyone who is in the field of training, but you are helping everyone who is lucky enough to find your site. I really enjoyed this post! Pricing your service correctly from the very beginning is extremely important for the following big reason, which I have dealt with on numerous occassions. I have had more than my share of tight wads. who I promptly transitioned off of my training schedule when someone who was willing to pay me my worth care along. Unfortunately, newer trainers don’t always have the option of picking and choosing quality clients. This is because of inexperience and lack of self-confidence. In 1999 when I began in the industry, I only charged a flat $50 a session. My self confidence sucked big time. Today, I average $75 per session, plus a surcharge for home training and gas stipend. End result is $100 per session, and no discounts for packages less then 72 sessions. Here is what I do now, and recommend this to all personal trainers…. If During the initial consultation, a potential client attempts to weasel me down in price, I stand up, let them know I am greatly insulted, and walk out of the consultation. Sometimes they call me back, and I just refer them to one of my junior trainers. HAHA – Rivak you’re sick! I love it – yeah if you’re a tight wad get out of my face – what, you haven’t even tried my training yet, and all you’ve heard is good things, and you want to start bargaining? Find someone else – you want me to throw on a free session? Do you know it costs me an hour of my time to do that, which someone is more than happy to pay for? See ya! Yeah, I know the newer trainers might be hesitant to charge more, but when you do, it fills you with energy to perform and love for what you do – and you of course respect yourself and people respect you more – btw Rivak, with your experience and the quality of your marketing I’d raise my rates. Yeah Jay I agree – if you’re a serious trainer and work hard to do a good job, and you DON’T cost more, clients are like “huh?”. And thanks for the positive feedback – I know, I’m in a tough situation because trainers that find my blog don’t want to tell anyone else about it! Rivak, haha, I almost fell out of my chair laughing at that. Then I thought about it a little more, and you and Kaiser are successful and agree completely so there must be something to this attitude – If there’s a way to fast-track that kind of super-confidence, I’d love to hear it. I know exactly what you mean! When I think of working in a gym for low pay, it sounds really boring to me. I know a few trainers that do this and they’re not motivated at all. But the trainers I know that are on their own are really high energy and cool people. When I think about starting my own training business and charge a lot, it just gets me pumped and ready to work hard! So I get what you’re saying Kaiser – if you don’t charge enough, you don’t get motivated to do anything and it hurts your self-confidence. Yeah there is Doug – it’s real simple – try more things and make more mistakes! Of course get the best info you can possibly get before you make your move, but you’ll inevitably still screw some things up and make a partial fool of yourself! Kaiser, great post and I agree with you 100% that you should value yourself as THE high-end trainer. You become what you think about, so if you genuinely value yourself as important as a doctor, you CAN charge high rates. Perception = Reality. Coming from a major gym, tomorrow I have my first private session, she’s an ex-client from my gym and is ready to spend. First off, how do you put a client on a ‘contract’? Even if it’s for 10 sessions, do you have certain paperwork you use for that? And do you give a discount per session if they buy bigger packages? And also, how do you accept payments? I remember reading in the Whistleblower that cash-only or check-only is not the most professional. What other options are there? And over the course of training this client, casually ask her for referrals – one client can turn into five very quickly! great post, I am always amazed at my ability to close clients for “all the money” without flinching !! Kaiser hits all points, confidence, abilty, etc. people like doing business with succesful people !! answering the above questions: for the teacher, I would give them a break to get started with the understanding prices will be working to the amount you will need to charge. I dont do contracts, always explaining unlike like a gym, clients can make the choice, NO pressure !! plus I am confident they wont be leaving when you are the best trainer in town. Great post. 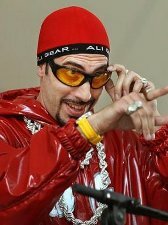 And love the Ali G reference. Hilarious. Trainers-definitely make your price and stick to it. When I was starting out-I was told a good idea is to find out the rates of other trainers in your area, and charge an average of those rates. Be patient. Give the business some time to grow. As trainers-we have all had our share of hearing “personal training is too expensive” but for most-this is just another excuse as to why they can’t/won’t start working out. I have trained several clients pro bono (for free-for all the non legal-eze out there) and they only last about 2-3 sessions before dropping out. For some it’s not a money issue, it’s a lack of work-ethic issue. A wise man once said, if you have a big enough “why” problem-you will always figure out a “how” solution. Just depends how big the problem is, you can figure out a “how” and solve the problem. If someone is haggling you over your prices, I really think they are not ready to change their lives. Just my 2 cents. Again, great post Kaiser. You da man. It’s hard to raise prices, but I think it benefits everybody involved. The client knows that she is getting quality service and you (the trainer) are more enthusiastic about delivering exceptional service. This is a great reminder to stick to my guns and have complete confidence in what I do. Kaiser – Great article. I think this is the one aspect that personal trainers have trouble with. I never get in an involved discussion with prospective clients. They talk, I listen, I give them a tour of our facility and then show them the price list. No debating, no discussion – just sign your name. I have always prided myself on offering the best in customer service and considering that I have clients that have been with me for 6-7 years, 3x/week speaks about what we are doing. I think a lot of trainers haven’t got quite the gist of customer service and that we work in a “service” industry. So treat your clients like gold and they will look after you by staying loyal. Hey Narina definitely agree with you – and it’s funny how much we’re all on the same page with this – it’s especially strange to see Bill, who runs a training business with additional staff, doesn’t really believe in contracts. That flies in the face of what you usually hear for that kind of business, but from what we’ve been talking about it makes total sense. Great post-one thing to keep in mind about pricing objections: many times it’s just a matter of helping that client see how they can afford it. When I tell potential clients I accept VISA or Mastercard, you can see their eyes light up and they’re ready to sign up! I’ve had others who thought they couldn’t afford a package of sessions, until I explained that they could split the package with their spouse/significant other/friend/family member. For example, in a package of 20 sessions the wife could use 10 and the husband the other 10, or any breakdown that works for them. It requires no additional work on my part, and it gives me 2 people who will recommend my services rather than 1! You don’t have to adjust your prices, just be a little creative in helping your client afford it! Well pricing for me is tough, not because I don’t think I am worth it but because the market in my area is soft. It is true that with a special need case client who must pass a state fitness test to become a prison guard, I did demand $45 a session and got it! incidently after 3 failed attempts he did pass so I felt really good about that. There are clients I have that pay me as little as $10 per session. If I didn’t enjoy working with these high motivated and young folks I wouldn’t do it, I do and so to accomodate them I lower my rates. So to say that it all comes down to ones self worth, is a bit simplistic and silly. THere are objective conditions that constrain what one can charge in such and such a market environment. If making $10 of even $45 will give you the kind of lifestyle you need, more power to you. In New York I couldn’t buy gas and have a roof over my head, let alone have any kind of social life with that kind of money or invest in my own learning or future. I’m not looking to run myself into the ground as a charity case. That sounds cruel, but I don’t think anyone would want to train with this kind of person either. Charge what you’re worth, and then justify this value – very simple. And I’m not buying the part about what the market can handle. Read my Whistleblower Report. I started my training practice and earned 1K a week in a gym a few blocks away from Lefrak City Housing Projects. My greatest success was in the very working class area of Long Island City, where I incidentally trained right across the street from another high earning trainer, Cynthia Conde who now has her own fitness reality TV show. Being a little creative and always looking to the best we could for our clients, we found ways to make it work even in these environments. Keep reading the blog and the newsletters and I’m sure you’ll start to get the mindset of tightening up your rates your schedule, and how you do things. In a capitalist economy, your income reflects in a lot of ways how much good you’re able to do in the world. If you are able to do a lot of good, you will be paid more for it. If you have little value to offer, then not so much. Unless your a crook or a scammer – but that always catches up to them, doesn’t it? I wrote a long NEWSLETTER on that subject. The key word is VALUE – that takes on an infinite number of forms. That’s what changed things for me and the difference I notice in the practice of every high level trainer – they bring a certain added value to training sessions that customers are willing to pay for. And most times it has nothing to do with simply your certifications or techniques, which most trainers confuse as the only forms of value. As far as pricing goes. It’s not about content. The client doesn’t really care about that before they pay. What is important is social proof (testimonials) and how YOU (trainer) connects with their current struggle and sees hope with you as the vehicle to get there. Best to all of you starting out! We’ve all been there. Take what you need now, and work your face off so that you can do business on your own terms. Yo Kaiser! I dig it man, I’m changing the rates on my contract RIGHT NOW! This was a very helpful article! I absolutely enjoyed it, and everything mentioned makes absolute sense! I wish there’d be more articles like this: down to the nitty-gritty. Totally becoming my own boss! Thanks! Very good article. It is also important to look at factors such as if the personal trainer has certification and if so what kind of certification does that person have. Is it the ACE certification? Also, remember that if the personal trainer has their own studio chances are the cost will be higher. In regards to how much you should charge, I think the experience factor plays a huge role as well as how popular you are with your local community in terms of work! Charge the right amount! Good article and thanks for sharing! As a person just starting out in the fitness industry, this article was really helpful and informative. I am actually working out now what to charge the clients that I have ready to get training. As I am unqualified I am charging $30 an hour, I feel that I need to build up my confidence and gain a better understanding of training a client. Once I know all I need to know I can see I will have the tools to make some good money. As a soccer trainer I charge $25 per week two times for one hour. people pay with no questions. I look fit & I play and train my own son to become a scholarship colleague soccer player. my opinion is that you have to know what you doing and have no fear to challenge who you training with intensity and respect. always keep respect and distance from individuals that you train because it will become to personal. is just baseness. Thank u.